Want to be a total nerd badass while gunning through your written computer science exam? Then cop one of these Tersumus delete-key erasers. 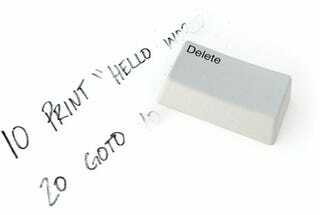 The palm-sized eraser will help you fix your sloppy coding mistakes and give you a second chance on your poor formating and syntax errors. They're not in stock yet, but you can get your pre-order on at $10.50 a pop, shipping in around mid-July. Mistakes can be costly. But just remember this—real haxorz don't need the delete key.